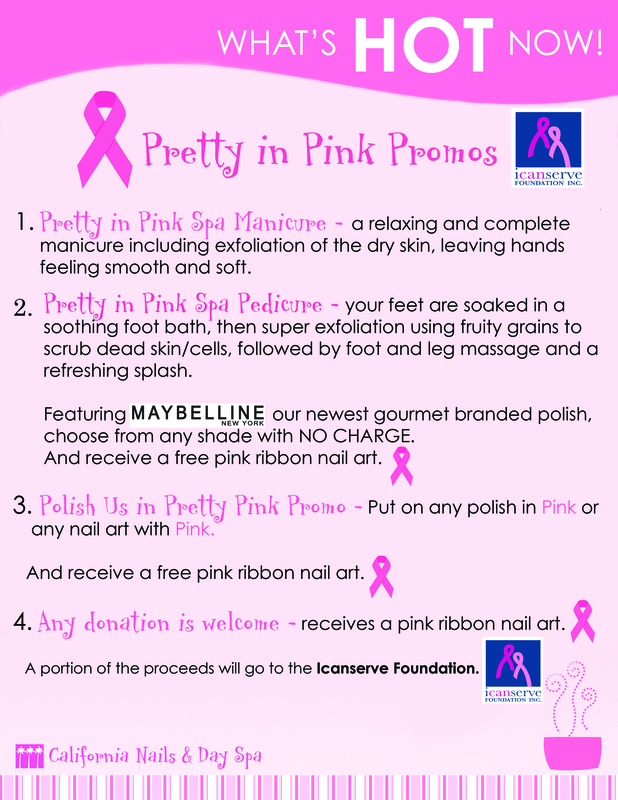 California Nails & Day Spa will offer Pretty in Pink services from October 10 to November 10, 2014, with a portion of proceeds going to ICanServe Foundation. Pretty in Pink Spa Manicure and Pretty in Pink Spa Pedicure feature Maybelline, its newest “gourmet branded polish”. Polish Us In Pretty Pink Promo (where customers can choose any pink polish or any nail art with pink) and any donation made to ICanServe Foundation will merit a free pink ribbon nail art. Let California Nails & Day Spa pamper you “pretty in pink” this October, breast cancer awareness month, and help ICanServe reach out to more women with hope and information.